Go!PushPops: “FIGMENTNYC2010” June 11-13, 2010 " Aerobic Utopia, Bagel Buns"
“FIGMENTNYC2010” June 11-13, 2010 " Aerobic Utopia, Bagel Buns"
The Push Pops Collective presents "AEROBIC UTOPIA – BAGEL BUNS". At the onset of another hot and sticky New York summer, The Push Pops Collective will give a two-day presentation on the best way to cut carbs and get those tight buns for the bikini season! Powered by the proven methodology of the Buns of Steel series, The Push Pops will provide free personal training and diet advice to Figment participants. 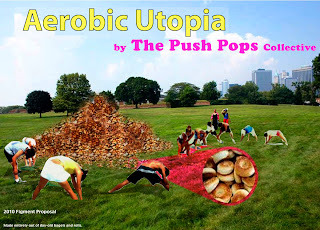 As part of Aerobic Utopia, The Push Pops will construct a giant pile of day-old bagels and rolls, collected in the weeks leading to Figment. Next to this symbolic victory hill, brightly clad Push Pops will lead several aerobic sessions to celebrate triumph over food addictions and unhealthy consumerist tendencies. The Bagel Hill will also raise awareness for the daily food waste occurring in this city.
" T A P E D "